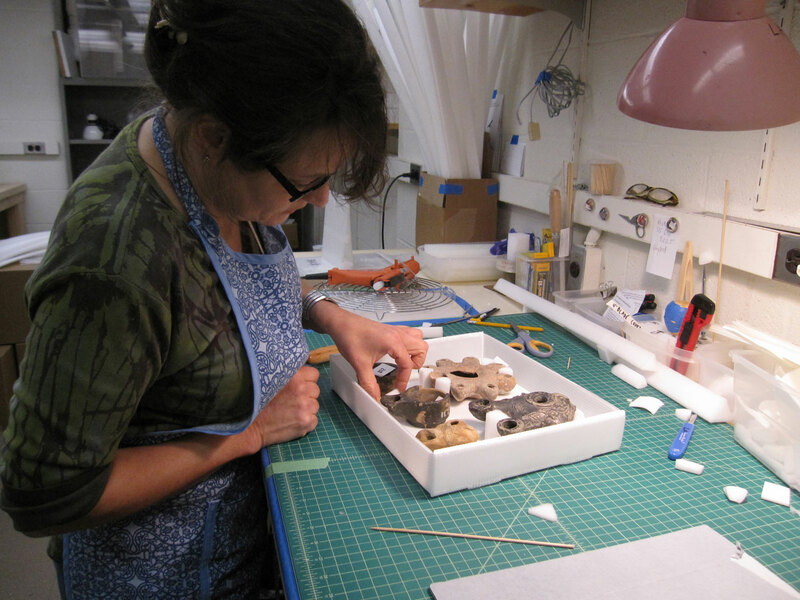 Lisa Anderson houses artifacts in new archival storage boxes. The museum collection comprises nearly 9000 artifacts, many of which have never been displayed or used for teaching because they were inaccessible in our prior museum spaces. Since the renovation of Gilman Hall, the museum has a new custom-built storage area for objects in our collection, and one of our major current projects is the cataloguing rehousing of the collection so that objects can be identified and used for teaching and research as well as safely,but accessibly placed in storage. The rehousing process requires several steps. The first is unpacking objects from the boxes in which they were placed nearly four years ago in preparation for the Gilman renovation project. Each object is then placed in a custom-fitted archival box to make it easier to see, move and use in teaching. 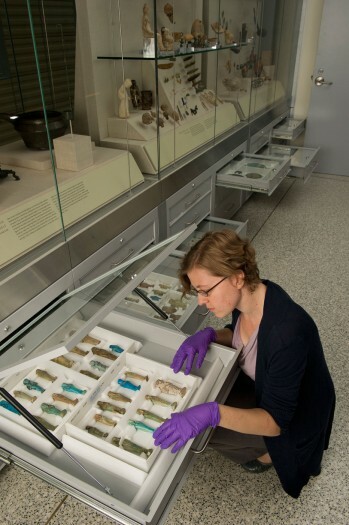 More elaborate or fragile objects are rehoused by our collections specialist Lisa Anderson, seen here. Once the objects have been rehoused, they are transported to the museum where each archival box is labeled by our staff. The artifacts are then catalogued into the museum database, and any archival information known about them are photocopied and scanned for the museum files. The objects are then photographed and placed in either the museum study drawers so that they can be easily removed for teaching or study, or housed in the new museum storage area. Click here for views of some items recently rehoused into archival storage containers.